Nienke suggested that you try to build your own cross-sell models for the other products you want to include in the next best offer. Try to first build a couple of trees – or more if you are getting the hang of it! 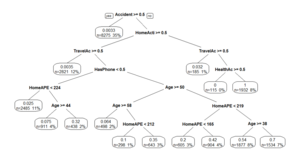 After you created different decision trees, work with the rank or index method based on your predicted probabilities to determine the next best offer. (Hint: If you need a little help with these methods, check out the additional material section in the previous unit). Use your model outcomes in a briefing to your colleagues. You want to activate them by showing them the new way of using predictive modelling to derive the Next Best Offer per customer. In this way your company can be more relevant - and thus personal - to the customer. Take them through the most important process-steps. 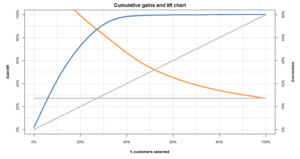 With a cp of 0.003, an RSquare of 0.61 and an AUC of 0.95 the following predictive model was created to find for with customers this product would be the a good fit. During the data preparation stage, in order to create the training set I removed the CarAPE attribute to avoid circular causalities and this is what I got. In conclusion, one of the main attributes that determines whether a customer's next best offer would be a car insurance is if the customer does not already have an accidents policy among others of course.